The origins of The Band as Bob Dylan's backing group are well known, but with songs like 'The Night They Drove Old Dixie Down' they forged their own unique American sound. In the post-Civil War South, Virgil Cane recalls Union soldiers destroying the railroad on which he served, the April 1865 fall of the Confederacy capital of Richmond, Virginia, and the fate of his 18-year-old brother — 'proud and brave, but a Yankee laid him in his grave'. Not only had the war brought about more than 620,000 deaths, but, as Cane observes, it destroyed an entire way of life — 'You take what you need and you leave the rest,' he reasons, 'but they should never have taken the very best'. A straightforward yet touching reflection on the sometimes devastating effects of fighting for what one believes in, 'The Night They Drove Old Dixie Down' is an evocative slice of Americana, focussing on one of the most divisive and tragic periods in the nation's brief history. Which makes it all the more remarkable that the original version of this classic folk ballad, although sung by a native of Arkansas, was otherwise performed by a bunch of Canadians, including its composer who happened to be half-Mohawk Indian, half-Jew. They were, in short, the members of The Band. Said songwriter, Robbie Robertson, had tapped into Southern pride and pain when visiting that region. "I liked the way people talked, I liked the way they moved," he recalled in a 1988 radio interview. "I liked being in a place that had rhythm in the air. I thought, 'No wonder they invented rock & roll here. Everything sounds like music...' I got to come into this world a cold outsider — cold literally from Canada — and because I didn't take it for granted, it made me write something like 'The Night They Drove Old Dixie Down'. These old men would say, 'Yeah, but never mind, Robbie. One of these days the South is going to rise again.' I didn't take it as a joke. I thought it was really touching that these people lived this world from the standpoint of a rocking chair." Indeed, the aforementioned singer, Levon Helm, advised Robertson to excise a verse about Abraham Lincoln that might antagonize those who still raised the Confederate flag, and the result was a classic composition that, amid the late-'60s Civil Rights backlash against the traditional South, sensitively presented a Southern point of view. "It took me about eight months in all to write that song," Robbie Robertson was later quoted as saying in Barney Hoskyns' book Across The Great Divide. "I only had the music for it, and I didn't know what it was about at all. I'd sit down at the piano and play these chords over and over again. And then one day the rest of it came to me. Sometimes you have to wait a song out, and I'm glad I waited for that one." 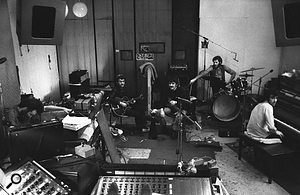 So were drummer/vocalist Levon Helm and guitarist Robertson's other colleagues in The Band; bass player/singer Rick Danko, pianist/singer Richard Manuel and organist Garth Hudson. This outfit, evolved from rocker Ronnie Hawkins' sidemen, the Hawks, had gained fame by association with Bob Dylan before stepping out on its own in 1968 and recording the widely acclaimed Music From Big Pink album that featured Robertson's minor chart hit 'The Weight' and a cover of Dylan's 'I Shall Be Released' among its 11 influentially roots-rock numbers about family traditions and rural life. Flying in the face of the era's counter-culture psychedelia, this debut was surpassed both musically and compositionally by The Band's self-titled follow-up, released in September 1969, which spawned the singles 'Rag Mama Rag' and 'Up On Cripple Creek' in addition to 'The Night They Drove Old Dixie Down'. In the studio to produce both albums was John Simon, who has also been credited as one of the engineers on the second record, even though he insists that none existed for those sessions. Born August 11th, 1941, in Norwalk, Connecticut, John Simon was taught to play both the fiddle and the piano from age four by his father, a country doctor and violinist. Before he was ten, JS was writing his own songs; in his teens he led and composed for several bands in addition to writing a couple of musicals; and at Princeton University he wrote three more shows and performed in several bands for which he composed original material, including one that he led to the finals of the first Georgetown Jazz Festival. Thereafter, Simon joined Columbia Records in New York as a trainee producer and, after assisting on various cast recordings, novelty records and documentary albums, enjoyed his first pop success with the Cyrkle's 'Red Rubber Ball', which reached number two on the US charts in 1966. A couple of years later he co-produced the counter-culture music documentary You Are What You Eat, with Peter Yarrow and Barry Feinstein, and it was during the course of this project that he was introduced to The Band, for whom he subsequently assembled a demo tape that helped secure a contract with Capitol Records. 1968 was quite a year for John Simon. He produced Cheap Thrills by Janis Joplin with Big Brother & the Holding Company, Child is Father to the Man by Blood, Sweat & Tears, the Songs of Leonard Cohen album and The Band's Music from Big Pink, while also working on Simon & Garfunkel's Bookends LP and tracks by 'Mama' Cass Elliot and Gordon Lightfoot. Quite a haul, and aside from the Leonard Cohen and Bookends projects, all done freelance before Simon then produced The Band — an ensemble that he describes as "incredibly selfless and pragmatic. "They had very few ego problems," continues Simon. "None of The Band's members cared who played what instrument. Whatever worked for the song was good. They'd been playing together for years and were consummate musicians." There's A Studio In My Pool House! The initial sessions for Big Pink had taken place during the winter of 1967/68 at the studio that John Simon knew best — the former Columbia facility where he had first worked, subsequently owned by A&R Recording, located at 799 Seventh Avenue — before the album was completed at Capitol Studios in Hollywood. 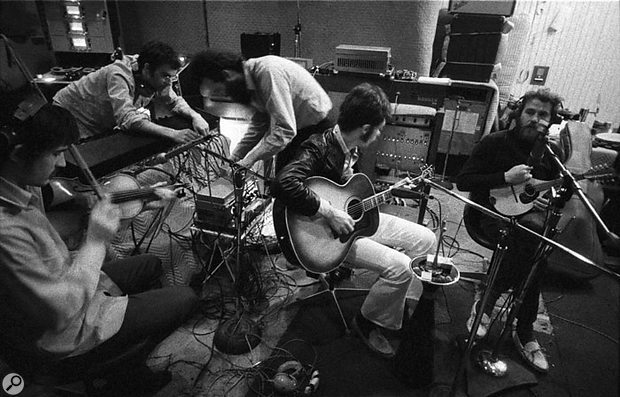 By the time work commenced on the second album in the winter of 1968/69, Capitol had been persuaded to supply a console, an eight-track 3M tape machine, Altec 604 monitors and an EMT echo chamber for The Band's own studio, set up in a rented house in the Hollywood Hills that had once belonged to Sammy Davis Jr and actor Wally Cox. "Capitol took a long time delivering the stuff and installing the equipment," Simon recalls. "Meanwhile, Robbie was writing and we were rehearsing some of the songs, but the group had a deadline because they were playing a gig that [promoter] Bill Graham had put together in San Francisco. That meant we had to finish things up, and since we didn't quite finish them up we did 'Whispering Pines', 'Get Up Jake' and 'Jemima Surrender' at the old Hit Factory in New York, when Jerry Ragavoy owned it." The Band in the pool house studio, 1969. Photo: Elliott Landy/RedfernsSince there were purportedly no engineers on the sessions, Simon doesn't have specific recall of much of the equipment used. "I remember we needed a piano," he says, "and instead of getting a grand piano we got an old upright that we picked up some place in town. Meanwhile, Levon got his drums from a pawn shop, a set with wood rims... We miked the piano and general utility stuff with some old Sennheisers — we must have had a lot of those — and we had a couple of Neumann U87s for vocals, as well as Electro-Voice RE15s for brightness. I always used a pretty awful mic on the snare drum — an Altec 'saltshaker' — which was a suggestion of [producer/engineer] Roy Halee, whom I knew at Columbia Records. Aside from that, we used some old Pultec outrigger equalisers, the EMT plate and we also had a shower stall that we used for echo — we put a speaker and a mic in there. "Sammy Davis had this pool house; a big, cavernous, barn-like room — and we had the mixing console in there along with the instruments. And what we would do to get our sound was do rough takes during our rehearsals, listen back to those rough takes, fix them up again, and then by the time we were ready to do it we didn't have to do any monitoring of the sound. The bass was recorded direct, the guitars were recorded with amps, and I know the drums were sitting behind some baffles in the room... The photo of that set-up on the album cover [and above] is pretty accurate, although we removed the baffles and a lot of the mics — aside from one RE15 — so that you could see the drums. "If you were sitting at the board and looked around in a clockwise fashion, Garth was up against the wall at nine o'clock, Levon was up against another wall at one o'clock, the piano was up against a wall at around three o'clock, and the guitar and the bass were in the middle, or the mandolin or whatever they were playing. In fact, there's also a photo of me sort of playing — I don't play — the guitar, with Robbie trying different EQs with headphones at the board. That was for 'Rag Mama Rag', because Rick has the fiddle and Levon the mandolin." Robbie Robertson wrote or co-wrote all of the songs on the second album, yet he hadn't done so when the sessions commenced. "Robbie and his wife Dominique had just had their first child," Simon explains, "and the three of them, along with me and my wife, went to Hawaii the week before we were scheduled to start work. Well, he worked up some things there and I was just a pair of ears, and we also worked on some things for my own album. I actually began writing a song while we were there called 'Davy's On The Road Again' that Manfred Mann later had a hit with, and I asked for Robbie's advice on that and he gave me the chorus. So, we were bouncing things back and forth." Next stop, Sammy Davis Jr's pool house, by which time 'The Night They Drove Old Dixie Down' had been written. However, this was not the case regarding numerous other tracks, including 'Look Out Cleveland', 'Get Up Jake' and 'King Harvest'. "When we finally got all the equipment from Capitol together, we decided to hear what it sounded like," Simon recalls. "This was in the middle of the night, so we put on the most recent record that we liked, which was a Dr. John album [Babylon] that had a song ['The Patriotic Flag-Waiver'] with snatches of 'My Country Tis Of Thee' and 'America The Beautiful' in the chorus. Our wives were with us, and suddenly one of them ran in, saying, 'The cops are here! The cops are here!' We immediately went outside to see what was going on and it turned out that we'd also hooked the sound up to the outdoor pool speakers, so this patriotic song was just blasting through the Hollywood canyons." Two Days Per Song? Luxury! Once recording commenced, each song was worked on separately; great care being taken to capture the sound of every instrument courtesy of proper mic placement (so much for no engineering). At the same time, the musicians had to learn their parts, entailing a work schedule of about two days per song — the first day routining it, the next day recording. Photographer Elliott Landy is pictured (right) in this rarely published photo. It was taken with a Widelux camera, a rare mechanical Panoramic 35mm film camera. It was not 'stitched' together electronically as it might be today.Photo: Elliott Landy/Redferns"For us, that was quite luxurious," Simon asserts. "Sure, some people were taking a lot longer by then, but that was often necessitated by the fact that a lot of the bands had no talent and they therefore had to do things over and over and over again. In fact, my contention for how multitrack developed is that it was an answer to these artists' inability to record things live and need to overdub instead. However, once eight-track was established, it became a new art form." When Simon first heard 'The Night They Drove Old Dixie Down', Robbie Robertson was writing it at the piano — contrary to his usual method of writing with the guitar — and the chord progression had already been figured out. Then, when it came time to record, Robertson played acoustic guitar, Hudson played the organ, Manuel played piano and sang the high harmony, Danko played bass and sang the middle harmony, and Helm was on drums and lead vocal. "Garth may have used a Lowry organ," Simon comments. "He definitely had some instrument that bent, producing that kind of slide-whistle sound you can hear from the second verse onwards. I'm not sure how he got that — he may have got it with the left hand, using a dial on some electronic instrument, or he may have done it with a Lowry organ which had a pitch bender that you could operate with the side of your foot... Garth also played a little bit of trumpet on that song that you can barely hear until the end. "The only thing that was a little bit tricky rhythmically on that song was the fact that at the end of each verse there was a drum roll for the tempo to stop, and so it was important for everyone to be together at the downbeat of the chorus. That's something which most bands wouldn't attempt to do, because they don't have the ability." "Robbie's stated goal to me at the start of the second album, was that he wanted me to teach him everything I knew so that he could take over and I wouldn't be around for the next album," Simon recalls. Not that he was phased by this. "As much of a guitar player and a songwriter as he was, Robbie didn't know anything about recording at this point. He didn't know what a track sheet was, didn't know what it meant for a VU meter to go into the red. However, there also wasn't much that I taught him, and I think he realised that pretty quickly." Okay, but who pushed the faders? "Mostly me," comes the reply, "with Robbie taking over when I was playing." Indeed, Simon contributed tuba, horn and keyboards to the Band sessions. "Still, we didn't really need to push the faders," he continues. "We'd get everything set-up and then leave the faders and everyone would play. That was about it until it came to mixing time, and none of us had engineering degrees — we just did it. "I myself don't think engineers are that important when it comes to making music. I honestly don't. I'm happy listening to a very scratchy old recording of Robert Johnson or Bessie Smith or Bix Biederbecke — I'm much more interested in the music. And of course it's lovely if you can get a sound that's just gorgeous and feels like you're in a concert hall when you hear a full symphonic orchestra — that requires an engineer, because I think the real challenge for engineers is recording large ensembles. I don't think there's much to recording a small group, especially one instrument at a time — there's hardly anything to it! "I've spent so much time in studios wasting time, waiting for an engineer to fiddle with this and fiddle with that, whereas all I care about is that there's no break-up, no feedback, no distortion. That's all the engineer's supposed to do. And that's all they ever had to do when I broke into the business. The engineer was just responsible for a clean sound, nothing special. I mean, some of the great, classic blues tracks that came out of Chess in Chicago were down to just two microphones in a room!" Of the eight tracks on tape, a couple each were initially assigned to stereo drums and stereo piano — one of the latter shared with guitar — while single tracks were used for the bass, organ and lead. These were then bounced down and three tracks made available for all the vocals, with another for the aforementioned trumpet part. "When we were ready for mixing, there would always be two tracks of drums, one track of bass, independent vocals where possible, and that would mean the guitar and piano would be combined," Simon explains, "with the guitar up the middle and the piano on two tracks. Then again, while the lead vocal was often overdubbed, in this case Levon sang and played drums at the same time because of that tempo thing that had to be right for the transition into the chorus. That wasn't easy, but Levon had been doing it live, so he'd sort of make way for his vocal and support it as opposed to being a bashy drummer who'd cause drum leakage getting into the vocal microphone. What's more, we'd have the opportunity to try those things the day before and get them right; get the mic positioning right and use a mic that had a good rejection factor for the back end of it. I can't be sure what mic we used in this case, but it may well have been a U87. "I know we tried a lot of live track-combining, maybe putting three vocals on two tracks; splitting one vocal between two, so those vocal levels would be locked at the moment of being recorded." The mix itself was done at A&R Recording in New York by John Simon and Tony May, who Simon describes as "an excellent engineer who taught me a lot. One of the things that he taught me when getting a mix going was to start with the bass and get it so it hung around minus seven on the VU meter, then bring the bass drum up to match that, then take the bass down and make the snare drum match the bass drum, and then leave the whole kit up, bring the bass back in and have a good foundation to work with. "Tony and I did a lot of hands-on stuff for that second album. This was pre-automation and everything had to be mixed by hand, so there was a lot of fader-moving up and down and sometimes you had to have four hands on the faders instead of two in order to get things right". When listening to the eight-tracks more than three decades later, Simon admits that in his opinion the sound is "fabulous. Not hyped up, no embellishments. We didn't limit the crap out of everything. Instead of digital echoes or digital reverbs we used real echo. The effects we did use back then came out of the guitar amp, and Allison in Nashville had just come out with a noise gate that we sometimes used. Basically, we'd try anything that came our way. Sometimes the companies would give us stuff and we'd just hook it in and see what we could do with it. "When I hear The Band now, I remember what a great time it was. It was fabulous, a very free time, flower-power and 'make love, not war', and while fighting in Vietnam was not our decision, we could have music, thank you very much. So, musically it was an incredible period, with everyone using it to express themselves, and the guys we're talking about here were so very talented." Though not a chart hit for The Band, 'The Night They Drove Old Dixie Down' did become a popular radio track, before the song's first cover, by Joan Baez, went Top Five in 1971. Still, this version was replete with lyrical errors, the most notorious of which — by inserting 'the' before 'Robert E. Lee' — transformed an esteemed General into a steamboat. As John Simon says, "that's just sloppy..."